A load balanced with high availability cluster needs at least sever server, but the optimum deployment is with eleven. In addition, there is an arbitrator server. 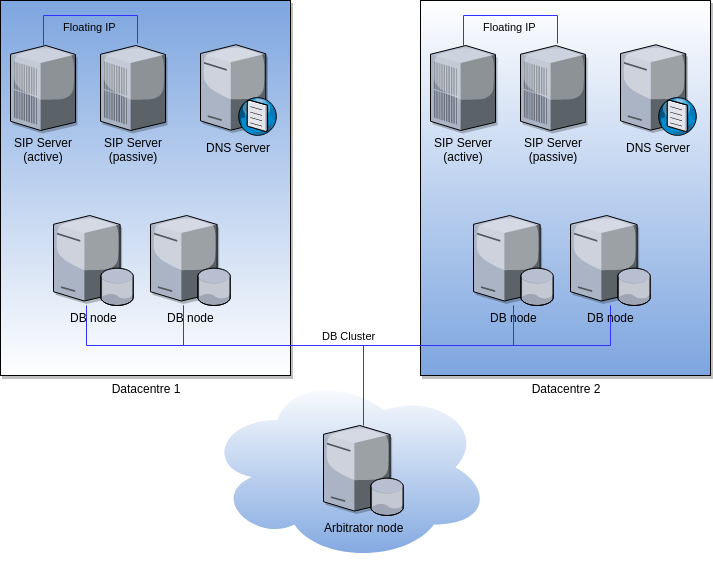 The arbitrator is required as the database cluster needs to be 2*n+1 nodes (odd number). Each time you do a change, you will need to flush the Memcached on all the servers. You may put a crontab to fix this. You need to remember that because this is a cluster, and you really do not know what server is being accessed, the file synchronization is not real-time. Real-time synchronization is possible, but it is a waste of resources, it is better to put a policy to sync things each hour. Never, but never reboot all the database nodes at once. If you need to reboot, reboot one per one. The Gallera cluster needs at last one node to be up and running in order to keep sync with new ones. The router needs to be VoIP friendly, especially with the ARP tables. If your router has any kind of ARP cache, disable it. The information flow is the same as the high availability approach in each data centre and as the load balanced on the high-level view. As this approach is a mix, the following table helps to understand.